ADY - Active Dry Yeast. ANODIZED - I really don't know what anodized means, but I assume it has something to do with anodes. When this word is used to describe pizza pans, it refers to a dark coating that was applied to the pan in the factory. AUTOLYSE - Basically to autolyse ("auto-leese") means to mix only the water and flour from a dough formula and let it sit for a while before adding the remainder of the dough ingredients and mixing completely. Usually when I see people mention autolysis on the internet, they're actually talking about making a pre-ferment, not autolysis. BAKER - Someone who bakes. Chefs, bakers, and pizzaioli (pizzamakers) are all different things. BAKERS' PERCENTAGES (or bakers' percents) - A system of notation in baking. Read the basics of bakers' percentages. BRICK OVEN - A marketing term, not an actual type of oven. Although some ovens are made of brick, when I hear or read someone using the term 'brick oven,' I don't know what they're talking about. I assume they don't know what they are talking about, either, or they're trying to pull one over on me, because ovens that are actually made of brick are not called 'brick ovens.' Rather, they are called wood-fired ovens, which is a better marketing term than 'brick oven' anyway. If a pizzeria tries to lure you by advertising their "brick oven," I'd say it's a safe bet that they make crap pizza and they try to rely on the gullibility of chump consumers to keep them in business. BROMATED - Some flours are bromated, which means potassium bromate has been added to the flour. I have a very limited grasp of what this means, but I do know that bromated flours are essential to making great NY style pizza. BULK FERMENT - To allow an entire batch dough to ferment (or rise) as a large mass of dough before dividing and scaling the dough into dough balls or skins. CELEBRITY CHEF - A celebrity with a cooking show who confidently teaches you "the right way" to make pizza. This includes Alton Brown, Emeril, Tyler Florence, Wolfgang Puck, Rachel Ray, and Bobby Flay. CHEF - A professional cook. CONVEYOR OVEN - Ovens commonly used in chain pizza stores. They have conveyors inside, made of linked metal wires, which give each pizza a free ride through the oven for a programmed length of time and eliminates the need for a skilled oven tender. As far as I'm concerned, conveyor ovens are just industrial-strength hair dryers. They're appropriate for any pizza shop that wants to sell pizza that requires no skill to create, but they cannot produce a pizza with the same quality of pizza baked in deck ovens or other ovens without moving parts. CORDIERITE - Probably the most common pizza stone material. CRUMB - The structure of the inside of a baked pizza or bread. CUTTER PAN - A flat pizza pan with edges that angle up at about 45 degrees for about half an inch. Most commonly used for Pizza Hut thin crust. It's called a cutter pan because its design makes it easy to cut a sheeted piece of dough into a perfect circle with edges that angle upward. Using a sheeted piece of dough that's larger than the diameter of the pan, all you have to do is place the dough on top of the pan and use a roller to cut the dough on the edge of the pan. DECK OVEN - Gas or electric ovens with no moving parts, usually with a slab of stone as the hearth (or deck). DEVELOP - Used in reference to gluten. As dough is mixed, protein in the flour forms gluten and builds something akin to a chain link fence within the dough. At first, there is not much of a gluten structure; it's sort of like little pieces of metal that bear no resemblance to a fence. But as the dough continues to mix, these pieces join together and begin to resemble fence wires. Once enough "wires" have been formed, they begin to intertwine with each other and make the dough strong like a fence. DIVIDE - To cut a batch of dough into smaller pieces that are appropriate for specific sizes of pizza. DOCK - To poke dough in a regular pattern, in an effort to keep bubbles from forming in the crust while the pizza bakes. DOUGH DOCKER - A tool with a handle and several narrow spiked plastic wheels. Used to poke certain types of dough before they are baked, in an effort to keep bubbles from forming in the crust while the pizza bakes. Generally used on thin, sheeted pizza dough. DOUGH SKIN - A piece of dough that has been rolled or stretched and is ready to be topped. FORMULA - When using bakers' percents, this is the expression of how much of each ingredient should be used, in relation to the total amount of flour..
GLUTEN DEVELOPMENT - The process of protein in flour being transformed to gluten strands, which become a complex weave of these strands as the dough continues to be mixed. GLUTEN STRUCTURE - The complex weave from the previous line. GOURMET - A marketing word used to trick you into thinking something is good even though it's probably not. 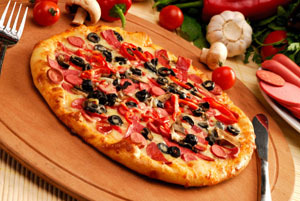 In pizza, 'gourmet' also usually indicates that a place sells pizza with unusual, uncommon toppings. HIGH GLUTEN FLOUR - Flour with a very high protein content, in relation to every other type of flour (usually about 13% to 14% protein). Used mostly for NY style dough, but also used for some other thin pizzas. IDY - Instant Dry Yeast. KNEAD - When I use the word 'knead,' I'm referring to the process of mixing dough on a countertop by hand. KNOCK DOWN - Generally used to describe the process of turning a NY style dough ball into a flat(ish) disc before stretching the dough. LEAVEN - To introduce air into a dough or batter; to lift the dough or batter. Rise. MIXER BOWL - The bowl that is used with a mixer, as opposed to any other bowl, which I may use to mix ingredients by hand. NEW YORK STYLE - When I mention NY style pizza, I'm talking about the pizza you get from slice joints, which is sometimes referred to as a "street slice." There is another NY style, though, which is often referred to as "elite" style. This style of pizza is baked in a coal-fired oven and is not sold by the slice. To better define NY style: NY style pizza is made from a relatively soft, simple dough, usually containing a small amount of oil, using high gluten flour that does not get bulk fermented. This dough is stretched by hand and and peeled directly onto the hot stone of a deck oven. It should be baked for about four minutes at around 650 degrees. Also, the sauce should be very simple. Processed, pulpy tomatoes usually work pretty well for me, but salt, sugar, basil and oregano may be added. I've also heard from a very reliable source that chicken stock is the secret ingredient of great NY style sauce, but for some reason I've still never tried it. NY style pizza dough is never bulk fermented. NY style pizza dough is never rolled with a rolling pin. NY style pizza is never baked on a pan or a screen. NY style pizza is never baked in a conveyor oven. If any of these things has been done, it's simply not a NY style pizza. Despite what you may have heard, NY style pizza does not have to be made with New York City tap water to be authentic. That's probably the second biggest pizza myth, behind the cornmeal-in-deep-dish myth. The real reason why it's hard to get "authentic" NY style pizza outside of New York is because there simply aren't many people outside the east coast who possess as much NY pizza knowledge as the typical New York pizzaiolo (or in some cases, the pizzeria owner). OIL - When I say 'oil' without indicating what kind of oil, I usually mean oil in general or I mean the kind of oil I've already mentioned earlier in the post. OVERMIX - Referring to dough. If you mix dough to full gluten development, you've probably over mixed it. This dough will likely be tough or hard, unless you've over mixed it so much that you've begun to break down the gluten structure. Don't know if I've ever done this. PAN GRIPPER - A tool used to remove pans from the oven. There are at least a couple different types of pan gripper. When I worked at Pizza Hut a long, long time ago, they used two different types of pan gripper. One was specially made for deep dish type pans, and the other was pliers (for the cutter pans). PAR-BAKE - To bake a dough skin for about 3-5 minutes, usually without any sauce or toppings on it. When pizza skins are par-baked, they must cool down before being topped with sauce, cheese, and toppings. After this, the whole thing is baked again. I have yet to find a good reason to par bake any kind of pizza skin because to me it causes more trouble than it prevents, it's ridiculously inefficient, and it does not create a better pizza than any other set of baking procedures. PEEL (noun) - A pizza paddle. There are various kinds of peel, with the most common being a simple wood peel. A wood peel is usually used as a base to build a NY style or Neapolitan pizza, then as a vessel to transport the unbaked pizza to the oven, at which point you quickly pull the peel and leave the pizza on the stone surface of the oven. There are also metal peels, which can be used to retrieve pizza from the oven and/or as a surface on which the pizza may be cut. For Neapolitan pizza, there are also small turning peels, which are important to make sure the pizza gets baked evenly. I think there are also metal launching peels, as well. PEEL (verb) - The act of using a peel to insert an unbaked pizza into an oven. PERFORATED PAN - Any pizza pan with dozens of small holes in it. PIZZAIOLO - This means 'pizzamaker,' but it's some other language that I don't speak. PIZZAMAKER - Someone who is knowledgeable about pizza and well-practiced at the specialized discipline of baking pizzas. Specifically not a chef and not a baker. PRE-FERMENT - A partial mixture of any formulation's flour, water, and yeast. Usually this mixture is allowed to ferment overnight or for 24 hours, then the remaining ingredients are added and the dough is fully mixed. Some types of pre-ferment are poolish, biga, and sponge. I can't really tell you the difference between one type of pre-ferment and another. PROOF - Usually 'proof' means to store sheeted or stretched dough in a warm environment, like a proofer, to let it rise, thus giving the baked pizza a more airy, bready texture than a pizza that's baked immediately after shaping. An example of pizza that gets proofed is Pizza Hut pan pizza. PROVE - Adding yeast to a small amount of water both to hydrate the yeast and to give the yeast a chance to show that it's still alive and will effectively leaven the pizza or bread you intend to make. If the yeast is good, it will form a foamy layer on the top of the yeast water. Most commonly done with active dry yeast because instant yeast does not need to be hydrated. RETARD - OK, finish laughing now. 'Retard' means to slow down yeast activity by refrigerating dough. Even though you've always been told to let dough rise in a warm environment, it is very common to retard pizza dough. ROUND (noun) - A dough ball that has been rounded and tightened. ROUND (verb) - To take an oddly-shaped piece of dough and make it round (and tight). SAME-DAY DOUGH - (Or emergency dough.) Any dough that is intended to be used the same day it's mixed. Usually contains a higher yeast content than a similar dough intended to be used at least a day later. Also, same-day dough is usually not refrigerated. SCALE (verb) - Synonymous with 'weigh.' To use a scale to make sure you're using the right amount of an ingredient or dough. SCRAPS (or SCRAP DOUGH) - When making a sheeted (or rolled) dough skin, you usually have to start with more dough than is required for the pizza. You roll the dough to a larger size than the skin needs to be, then you use a pan as a template to trim the excess dough, making the skin both round and the proper size. The discarded dough is what I call 'scraps' or 'dough scraps.' I almost always refrigerate scraps immediately after I trim, then I add the scraps to my next batch of dough. If there is no next batch of dough, I sometimes use the scraps to make a wing-it pizza. Most notably, I tend to use scraps for Tommy's style dough. SCREEN - A rigid aluminum device similar to a pan but with a meshy structure. You can see screens in some of my pictures of pizzas just after they've been baked. I use them mostly as a cooling rack to keep water vapor from condensing on the bottom of hot pizzas straight out of the oven. SEASON - To coat a pan with a thin layer of oil, then bake the pan so the oil will burn onto the pan and darken the pan. Dark pans attract heat, leading to a shorter bake time, while light-colored pans reflect heat, leading to a longer bake time. SEASONED - Refers to a pan that has had a thin layer of oil baked onto it, making the pan darker. SKIN - A piece of dough that has already been rolled or stretched and is ready to be topped. SMOKE POINT - The temperature at which oil begins to smoke and burn. STONE - Pizza stone or baking stone. UNDERCRUST - The bottom of a baked pizza. UNDERMIX - To mix dough for a shorter length of time than might seem necessary. I've evolved to a point where I under mix most of my dough. YEAST WATER - A small amount (maybe 20%) of the overall water you've measured for a batch of dough. Obviously you add yeast to this water, to hydrate and prove the yeast. When the water becomes foamy, you know your yeast is both alive and hydrated. If you use an abundance of water, the water will not become foamy, even though the yeast is probably fine.